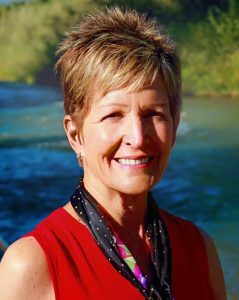 Karyn Almendarez is a retired second-grade teacher, writer, and blogger. She lives in Colorado with her husband, Albert. When she is not teaching or writing, she enjoys visiting her daughter, son-in-law, and four grandchildren in Texas. She also enjoys snow skiing and hiking. Karyn Almendarez is not a minister or counselor. She is a teacher, wife, and grandmother who others have encouraged to share her journey through grief with others to help them have hope and faith in God’s master plan. Nineteen years after her son’s death, Karyn Almendarez’s story provides a reflective look at the events in her life that point to God’s master plan. Her childhood, education, career choice, family, friends, and faith have inspired her to share her personal journey of grief and hope. Karyn Almendarez is a second grade teacher and writer. She is the author of Tragedy’s Treasures, A Mom’s Journey Through Grief. Karyn Almendarez is a teacher and writer. She is the author of Tragedy’s Treasures, a Mom’s Journey Through Grief, her personal account of twelve faith-based treasures she discovered before, during, and after the death of her sixteen-year-old son in an early morning car accident. Visit her website www.karyn.almendarez.com . Karyn Almendarez is a second grade teacher and writer. She is the author of, Tragedy’s Treasures, A Mom’s Journey Through Grief. It is her personal account of twelve faith-based treasures she discovered before, during, and after the death of her sixteen-year-old son in an early morning car accident. She lives in Montrose, Colorado with her husband, Albert, and their cat, Minnie. She and her husband enjoy antiquing, snow skiing, and relaxing in the majestic mountain scenery surrounding them. Karyn’s daughter, son-in-law, and four grandchildren live in Texas. You may read her encouraging blog posts and sign up for her free newsletter at www.karyn.almendarez.com. Karyn Almendarez is a writer and second grade teacher who enjoys living in the mountains of Colorado. She is passionate about creating a safe and uplifting classroom environment where her students feel comfortable and willing to learn and grow. That same passion drives her to encourage and uplift others through her writing. 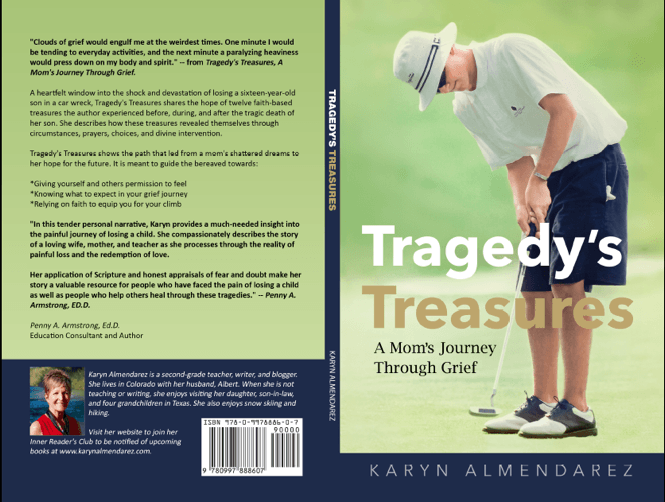 Her non-fiction book, Tragedy’s Treasures, a Mom’s Journey Through Grief, shares twelve faith-based treasures she discovered before, during, and after the death of her sixteen-year-old son in an early morning car accident. Her interest in writing and editing began in high school as she co-edited her high school newspaper. Then, her senior English teacher inspired her to learn to write more than just news copy. Before she and her husband moved to Colorado, she knew she wanted to write a book, and her students in Texas had encouraged her to write a book about her son. While on a horseback riding trip in Snowmass, Colorado, the inspiration for Tragedy’s Treasures bombarded her brain and heart. By the time the two-hour horseback ride was complete, she had the title, outline, and the number of chapters in her brain. The messy, hand-written notes she hurriedly wrote have morphed into her first book. She now lives in Montrose, Colorado with her husband, Albert, and their cat, Minnie. She and her husband enjoy antiquing, snow skiing, and relaxing in the majestic mountain scenery around them. Karyn’s daughter, son-in-law, and four grandchildren live in Texas. You may read her encouraging blog posts and sign up for her free newsletter at www.karynalmendarez.com. 1. Karyn Almendarez is a coffee addict. She heads to the coffee pot as soon as her feet hit the floor in the morning! 3. Karyn Almendarez played golf (even though she was never very good,) when she was not teaching. She was the golf coach at Southwest Christian School for a couple of years. Live with Laura: Interview with Author Karyn Almendarez from Live with Laura on Vimeo.